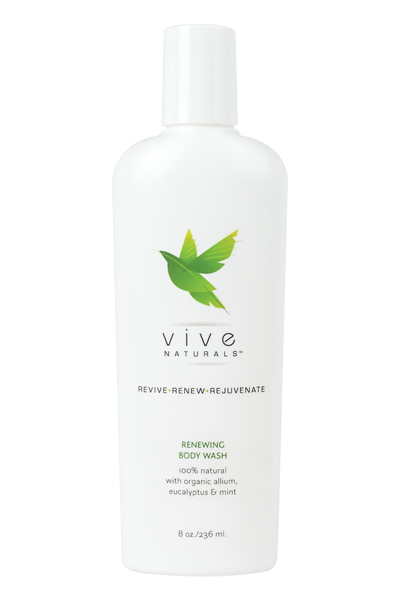 Aloe Vera Renewing Body Wash is formulated for normal and combination skin types. The deep cleaning oils is made from antioxidant-rich green tea oil and refreshing rosemary leaf oil. Vive’s spa-like healthy ingredients makes you feel and look great by moisturizing your skin. Its the healthiest way to start your day. Certified Organic Aloe Vera is the first strategic ingredient to help moisturize your skin and hair. With its natural abilities to absorb right into your skin Vive Naturals also helps with your wound recovery plus its rich in vitamin A, C, E, B1, B2, B6 all in one name, Vive Naturals. Most other skin or hair products made of 70% water, not Vive Naturals. 8 OZ bottle Ingredients: Organic Aloe Vera Extract, Saponified Oils of Coconut, Extracts of Chamomile and Quillija Saponaria, Avocado Oil, Almond Oil, Vegetable Glycerin; Allium sativum; Xanthan Gum ; Sage, Bamboo Silk, Jojoba Beads, Silk Amino Acids, ; Rosemary oil; Organic Green Tea, Geogard Ultra, Citric Acid; Eucalyptus and Mint.